Last week the National Security Archive joined fellow open government advocates in providing members of the Classification Reform Committee (CRC) — the White House-led Steering Committee created in response to the Public Interest Declassification Board‘s (PIDB) 2012 report to the president and tasked with leading a systematic program of classification reform — with the open government community’s commentary on PIDB’s recommendations for transforming classification. 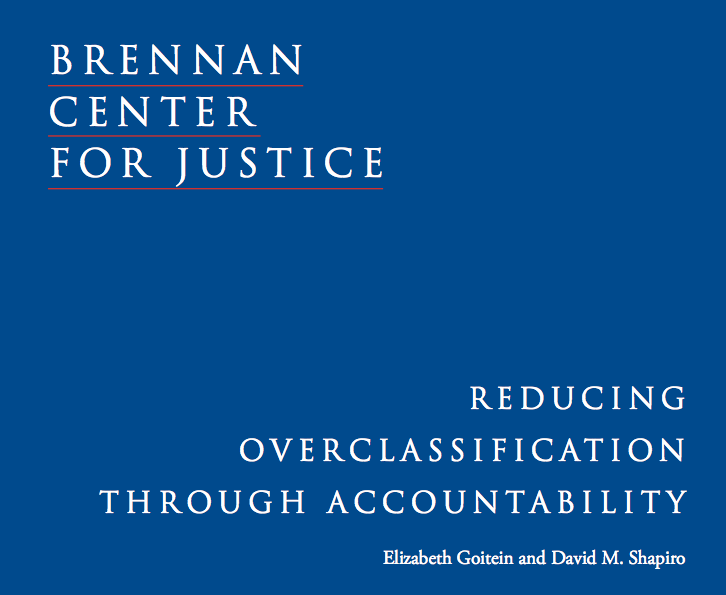 The Archive, the Brennan Center for Justice at NYU School of Law, The Constitution Project, the Federation of American Scientists, and OpenTheGovernment.org encouraged the CRC, among other things, to expand and improve Mandatory Declassification Review (MDR) and prohibit charging exorbitant MDR fees, ensure accountability for improper classification, and rescue the declassification process by ending agency equities at 25 years and establishing a process to ensure that public interest declassification occurs. We appreciated the chance to meet with you earlier this month. It was a very productive exchange, and we hope it represents the beginning of an ongoing dialogue between the Classification Reform Committee (CRC) and open government advocates. As we stated in the meeting, we were early supporters of the creation of your committee, and we believe your work is vital both to national security and to the proper functioning of our democracy. We know that one of your tasks is to consider the 2012 recommendations of the Public Interest Declassification Board (PIDB). To that end, we thought it might be helpful for you to see our commentary on the PIDB’s report. Our responses to the PIDB’s specific recommendations, which we provided to the PIDB in private communications, are attached. (1) Create a system of self-cancelling classification. We believe that the PIDB’s fifth recommendation (to create a system of self-cancelling classification) should be strengthened and expanded. We think that all classified information that is operational or based on a specific date or event should be automatically declassified when that operation or event passes without the option for additional review or exemption. This information should be specially marked “No Review” at the time of creation, and an actual automatic declassification process should be created. Of course, we recognize that there may be cases where circumstances change and information needs to remain classified for longer than originally specified. But for these types of documents, we think the default should be automatic declassification, with a special, non-automated process available for extending the deadline under changed circumstances. As the CRC no doubt recognizes, without creating truly automatic declassification for at least some categories of documents, there is no realistic possibility of declassification efforts keeping pace with classification in the electronic information age. (a) Create an “expedited review” track. Under the Freedom of Information Act (FOIA), expedited review is available for requests where there is a compelling need. There is no parallel provision for MDR. We believe the MDR process should include an expedited review option, with priority given to requests for information that would contribute significantly to a current public debate. A particularly compelling need would justify bypassing the administrative appeals process and going straight to ISCAP, which would then work within a suitably compressed time frame. (b) Remove arbitrary limits on requests. MDR is not available for information contained within an intelligence “operational file”; information that is the subject of pending litigation; or information required to be “submitted for prepublication review or other administrative process pursuant to an approved nondisclosure agreement.” Often, these categories of information are precisely those where the public interest in disclosure is highest. In criminal cases and habeas corpus cases, there is no practical way for attorneys to avoid litigation, and the limits on MDR can make it impossible to obtain independent review of the propriety of maintaining classification. Moreover, citizens seeking disclosure should not have to choose between a years-long, backlogged ISCAP process and Freedom of Information Act litigation with an extremely deferential standard of review. These limitations are needless barriers to timely declassification and should be removed. (c) Prohibit excessive fees. Agencies’ MDR fees typically mirror their FOIA fees. While the fee structures vary by agency, they generally are fair and prohibit agencies from requiring a requester to make advance payments unless an agency estimates the fees will be exorbitant. On September 23, 2011, however, the CIA posted into the Federal Register – without a notice for public comment – changes to its MDR fee regulations establishing that declassification reviews would cost requesters up to $72 per hour, even if no information was found or released. To submit a request, members of the public would have to agree to pay a minimum of $15. After thirty-six groups petitioned the CIA to repeal its regulations and one group filed suit, the CIA agreed to suspend implementation pending the lawsuit’s outcome. The CIA’s attempt in this instance to price requesters out of filing requests is antithetical to the principles of open government, or a sustainable system of classification. (3) Ensure accountability for improper classification. Under the current system, the person charged with reviewing the propriety of a classification decision (for instance, if an authorized holder brings a challenge) may be the very Original Classification Authority who classified the information in the first place. Such obvious conflicts of interest weaken existing oversight mechanisms. More broadly, there is no regular system in place for agencies to monitor classification decisions and to impose accountability for overclassification that is routine, deliberate, or grossly negligent. We recognize that original classification decisions are often judgment calls that are difficult to second-guess. But in those instances in which original classification decisions are clearly improper, accountability is critical. Moreover, improper uses of derivative classification authority should be relatively easy to identify. violating basic principles of statutory construction. A sensible working definition of “intelligence sources and methods” is in order. At a minimum, the president should specify that he interprets these terms, as used in the National Security Act, to include only those techniques the disclosure of which reasonably could be expected to harm national security. (a) End all agency equities at 25 years. The best mechanism to fundamentally transform classification is already required under the president’s executive order on classification; unfortunately, it is not followed by declassification authorities. 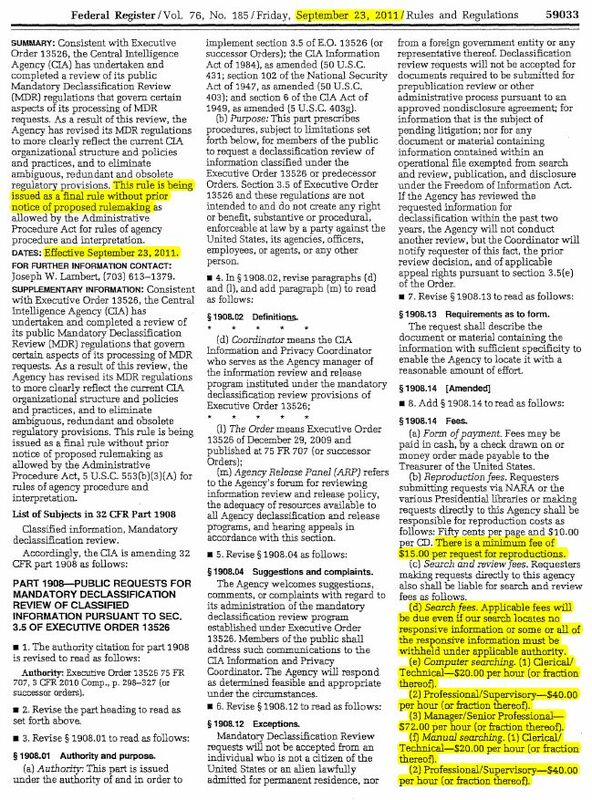 With limited exceptions, Executive Order 13526 mandates that, “[u]pon reaching the date or event [specified for declassification], the information shall be automatically declassified.” But instead, classified material that reaches the declassification date is referred to every agency that has potential “equities” in the information for line-by-line review, stalling declassification for years at a time (and sometimes indefinitely). President Obama instructed the NDC in his December 29, 2009, memorandum on Implementation of the Executive Order, “Classified National Security Information,” that “further referrals of these records [records of permanent historical value] are not required except for those containing information that would clearly and demonstrably reveal [confidential human sources or key WMD design concepts].”1 Despite this memo, the referral equity process for these historic documents has continued, rather than the President’s intended, streamlined process. The CRC at a minimum should ensure enforcement of the president’s order. It also should recommend that all agency equities end at 25 years, at which time the sole responsibility for declassification should lie with NDC and NARA. (b) Speed up the RD and FRD review process. The 1999 Kyl-Lott amendments that require the Department of Energy to review all information “not highly unlikely to contain RD/FRD” (Restricted Data and Formerly Restricted Data) throughout all U.S. National Archives and presidential libraries, and mandate that all agencies do a “Kyl-Lott” review for RD and FRD before declassifying documents in the future, has dramatically impeded the timely declassification of historically important records. The key to speeding up this process is for the administration and agency leadership to empower declassifiers to be less reticent about labeling documents as “highly unlikely to contain” RD or FRD, and, when RD/FRD review is truly necessary, to conduct it at the same time as declassification review. 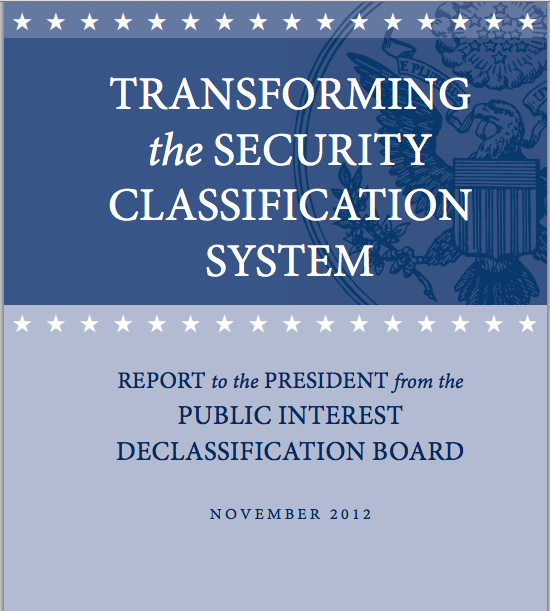 (c) Establish a process to ensure that public interest declassification occurs. As the General Counsel for the Director of National Intelligence recently urged,2 classifiers and declassifiers should make full use of the authority granted in Executive Order 13526 to declassify information when “public interest in disclosure outweighs the damage to the national security that might reasonably be expected from disclosure.”3 To that end, the CRC should take steps to develop and institutionalize a process to ensure that the public interest is considered during classification and declassification decisions. We hope that the above recommendations, along with the attached response to the PIDB’s report, are useful. We are happy to meet with you to discuss these further, and we look forward to being in touch as you move forward with your work. On the issue of defining “intelligence sources and methods,” it should be noted that E.O. 12958 and EO 13292 each specifically directed the Director of Central Intelligence to develop special procedures for handling intelligence sources and methods in MDR, and EO 13526 specifically directed the DNI to do the same. Despite these repeated explicit directives from the highest authority, CIA never once did so between 1995-2009 and ODNI still has not done so. I think one of the “low hanging fruit” reforms that the President should insist on is setting a hard and fast deadline for the DNI to do what President Clinton told the DCI to do two decades ago and finally put an end to the ad hoc processes currently in use.